Head coach John Stevens has been fired by the struggling Los Angeles Kings just 13 games into his second season in charge. Willie Desjardins, formerly of the Vancouver Canucks, was named the Kings' interim head coach Sunday. The Kings beat Columbus 4-1 on Saturday in Stevens' final game in charge, but Blake decided to make his second coaching change in 19 months after the team's terrible start. The Kings still have a wealth of top-end NHL talent including Hart Trophy finalist Anze Kopitar, Norris Trophy-winning defenceman Drew Doughty and high-scoring forward Jeff Carter alongside newcomer Ilya Kovalchuk. But with goalie Jonathan Quick missing all but four games because of injuries, Los Angeles has stumbled through the past 3 1/2 weeks with its top-heavy roster of well-paid veterans, inconsistent depth players and a patchy defence. "We have some real good players," Blake said. "We need them playing at a higher level. It's been an issue this season that we haven't had everyone going the right direction. [That's] partly the reason for this change." Blake said he has no long-standing connections with Desjardins, the Canucks' head coach from 2014-17. 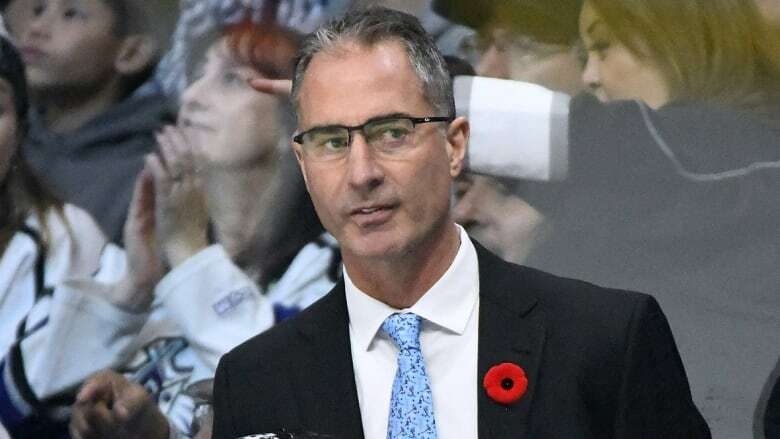 After Vancouver missed the playoffs in his final two seasons, Desjardins coached the Canadian men's national team to a bronze medal at the Olympics last February in Pyeongchang, South Korea. Los Angeles hosts Anaheim on Tuesday at 10:30 p.m. ET.